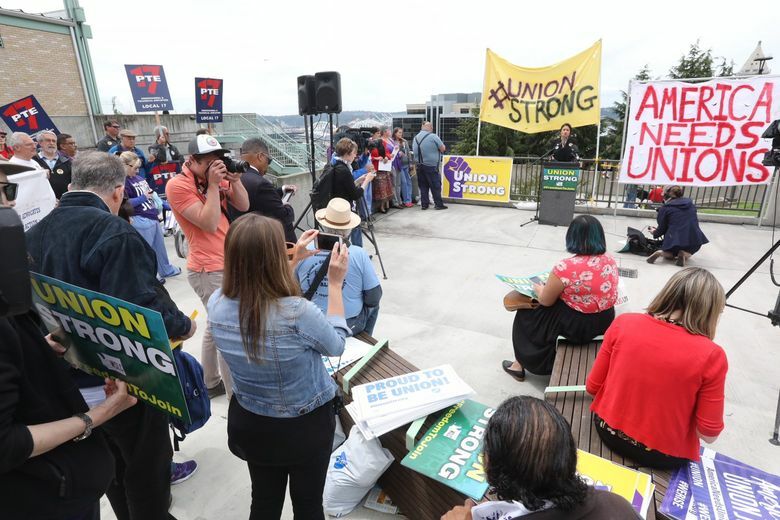 The decision threatens Washington state's public-sector unions, which are powerful players in both funding Democratic political campaigns and shaping public policy in Olympia. 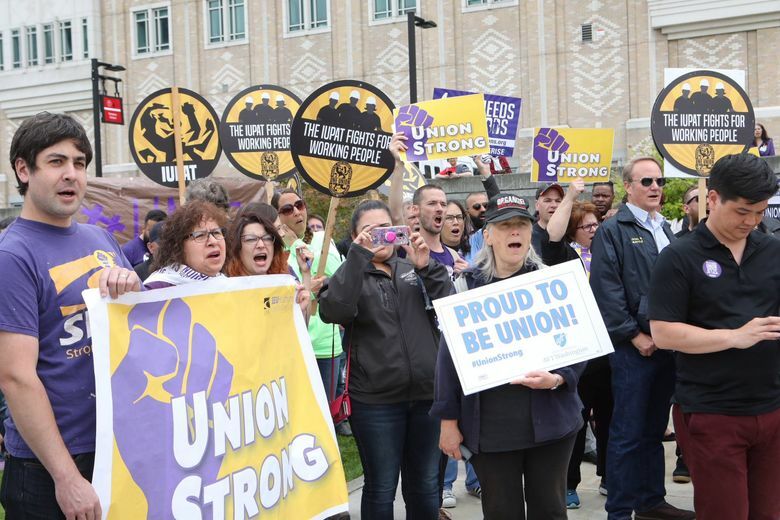 OLYMPIA — Wednesday’s U.S. Supreme Court ruling that says public employees can’t be forced to pay union fees is sure to escalate the fight in Washington state between unions and groups trying to erode their power. 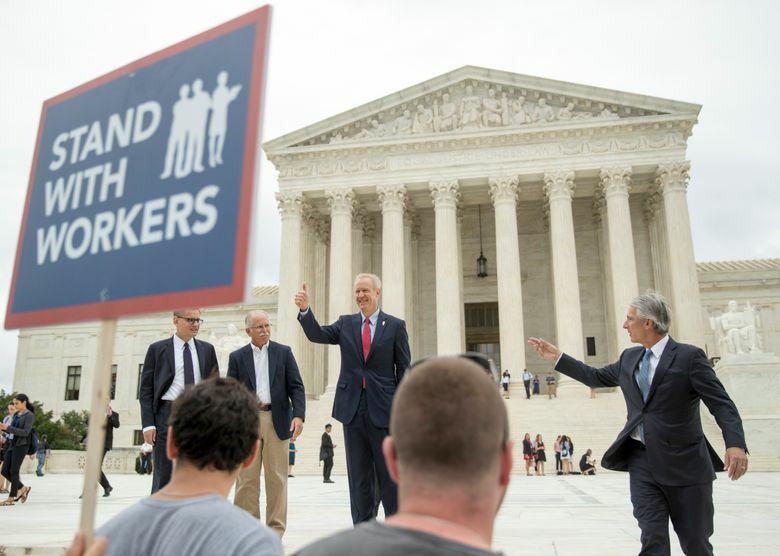 It’s unclear exactly how the ruling will impact Washington — which has one of the highest union membership rates in the nation — but it could diminish labor’s influence and reduce payments to unions that have become major donors to Democratic candidates and causes. The court’s 5-4 ruling reversed a 1977 Supreme Court decision and found that laws forcing public employees to pay fees to unions that represent them, even if the workers choose not to join, violate their free-speech rights. Labor leaders slammed the decision as part of an ongoing effort by wealthy individuals and big businesses to undermine unions. But it drew cheers among those who have chafed at labor’s power in Washington state politics and public policy. The conservative-leaning Freedom Foundation, which for years has sought to thin the ranks of the state’s public-sector unions, has already declared its intent to reach out to government employees to inform them that union fees are no longer required. In Olympia, unions have strong allies in the Legislature’s Democratic majorities and Democratic Gov. Jay Inslee. Since 2016, public-sector unions have donated nearly $800,000 directly to Democratic candidates for state office, and another $835,000 to state Democratic Party committees, according to the National Institute for Money in State Politics. The unions said the so-called agency fees at issue in the court case pay for collective bargaining and other work the union does on behalf of all employees, not just its members. More than half the states already have right-to-work laws banning mandatory fees, but most members of public-employee unions are concentrated in states that don’t, including California, New York and Illinois and Washington. “States and public-sector unions may no longer extract agency fees from nonconsenting employees,” Justice Samuel Alito said in his majority opinion in the latest case in which Neil Gorsuch, an appointee of President Donald Trump, provided a key fifth vote for a conservative outcome. 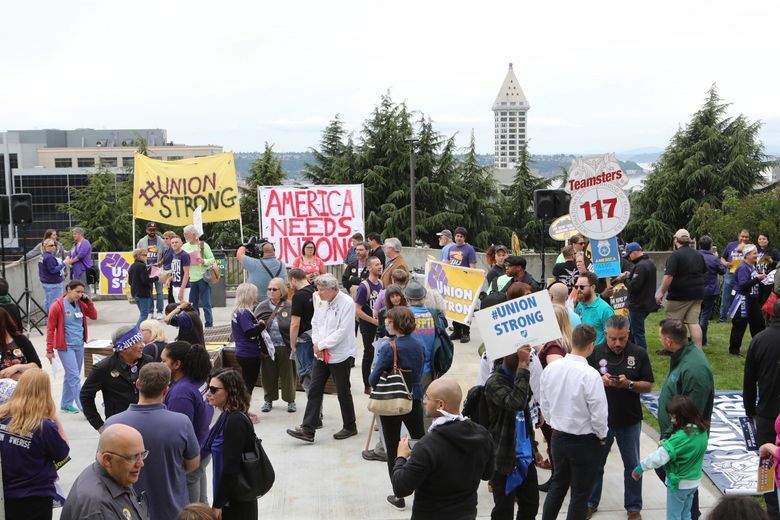 The ruling may invalidate one pro-union bill approved this year by Washington’s state Legislature, but Democratic lawmakers are already promising more help for labor groups. House Bill 2751 authorized an automatic deduction of union dues or agency fees paid by workers. Lawmakers this year also pushed for legislation — ultimately unsuccessful — to restrict the release of public employee information, such as birth dates, that the Freedom Foundation has used to locate and contact union members. That proposal drew criticism from open-government advocates, but Stonier said Democratic lawmakers may again push for such restrictions. Lawmakers expect to prepare more legislation to help unions, said Sen. Karen Keiser, D-Kent, and chair of the Senate Labor and Commerce Committee. “There will be many new initiatives in 2019,” she said. Even as they criticized Wednesday’s court ruling, several union officials downplayed its impact while also declining to say how many in their ranks pay agency fees, as opposing to full dues-paying members. A recent study by the nonprofit The Illinois Economic Policy Institute predicted public-employee unions in Washington could lose nearly 9 percent of their membership as a result of the ruling. Greg Devereux, executive director of the Washington State Federation of State Employees, said his organization has about 36,000 dues-paying members, and 5,000 who pay agency fees and therefore could be affected by the ruling. The idea behind agency fees is that public workers who don’t belong to the union — and therefore don’t pay dues — still benefit from the contracts negotiated on their behalf. Washington lawmakers last year approved state-worker raises that totaled $618 million over two years. Employees now paying agency fees can still voluntarily contribute under the ruling, Devereux said. Rich Wood, spokesman for the Washington Education Association, the state’s largest teachers union, said the organization has only a small percentage of nonunion members who are paying agency fees. Washington State Labor Council President Jeff Johnson and Secretary-Treasurer Lynne Dodson panned the ruling in a joint statement. At a union rally Wednesday afternoon at Harborview Medical Center, Kimela Vigil called the decision unfortunate.